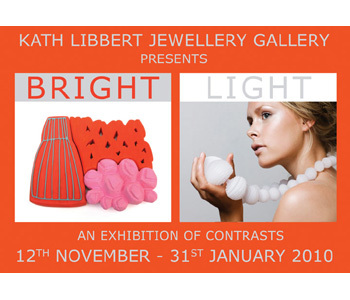 The twinkling lights and shiny baubles of Christmas may be appearing in the shops and on the high streets, but a new exhibition at the Kath Libbert Jewellery Gallery, Salts Mill, Saltaire, is set to outshine them all. Bright/Light is a showcase of work by ten sparkling new graduates and two highly talented ‘nearly new’ designers - both graduates of the prestigious Masters course at London’s Royal College of Art. Lina Peterson is a Swedish, experimental jewellery artist who is quickly gathering a strong international reputation; her bright, colourful brooches are playful ‘jigsaw puzzles’ of pieces in wood, textiles, silver and plastic. In contrast, Jahyun Rita Baek crafts gently moving geometric disks of light reflecting acrylic into elegant necklaces and earrings. Refusing to be outshone, the work of the ten new designers presents a mix of bright, bold exuberance of plastic, textiles, crystals and gemstones, shown alongside lovely light, quietly beautiful pieces in silver, creamy enamel and reclaimed ivory. Claire Knox-Bentham creates startling scarlet and orange ‘dripping’ plastic neckpieces and wall hangings, whilst Holly Edwards’ oxidised silver and iron neckpieces, arm pieces and brooches are huge, yet delicate, ethereal, yet strong – each moving strand is tipped with sharp red accents. Festival-inspired, vividly coloured rings and bangles by Deanna Baker sit alongside Hanni Ramsay’s sculptural, organic silver rings and Shona MacSween’s cute, crystal-studded creatures, resembling gargoyles, are little brooches to wear on your shoulder! Collections with a lighter touch include Lydia Feast’s pale enamel brooches set in silver, some with delicate etching of grasses and bestowed with enigmatic titles such as 'Moments In Between', 'Silence', and 'Chaos and Calm'. Dramatic, textured silver cuffs by Kerri Strachan are inspired by folds of fabric, whilst the shadows cast by shapes as mundane as milk bottles are the unlikely starting point for Jamie Price - fleeting plays of light are reflected in her intricate 'drawings' in silver wire, crafted into elegant, wearable brooches. Beautifully sophisticated brooches and earrings by Jen Brown explore surface pattern using enamel and gemstones and, finally, Ivy Nixon reflects the life and loves of Flaubert’s Madame Bovary, as she hangs interchangeable ‘attachments’ - a cross, a tiny, silver-tipped pencil, a vial holding a blade of grass - to a piano key brooch, creating ‘the ultimate adulteress’ companion’. Alongside Bright/Light there’s a further dash of dramatic glamour with a Black and Gold showcase; four gorgeous collections of eminently wearable jewellery created from inky jet, black silver and golden highlights. Just perfect for ‘decorating’ yourself this Christmas! Bea Jareno; Teri Howes; Sarah Herriot; Jacqueline Cullen.